More likely than not, you'll make your way to Lackland and Air Force Basic Military Training (AFBMT) by flying commercially to San Antonio. You may be flying by yourself, or you might be part of a group traveling together from your local Military Entrance Processing Station (MEPS). 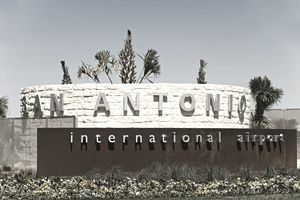 Once you arrive at the San Antonio Airport, you should pick up your bag, and then make your way to the "A" Terminal and report into the Air Force Receiving Station. For the first time, you will meet some T.I.s who will take a copy of your orders and direct you to a waiting area. You'll note that these T.I.s are pretty nice folks, and you'll think to yourself, "Wow! This isn't so bad." Just wait...you're not on the bus yet. Instilling discipline is not a matter for public display, so the real show doesn't start until you're away from the public airport. Depending on what time you arrive, you may have to wait a long time for your bus to leave. Take advantage of the time, and relax. It will be your last good "relaxation time" for a while. Enjoy the opportunity to chat with the others waiting. There's a good chance that those arriving at the same time will wind up being your flight mates. Pretty soon the T.I.s will line you up (this will be your first formation!) and march you out to the bus. The ride to Lackland AFB takes about an hour. You'll still be feeling pretty good. If there are T.I.s on the bus and they don't seem quite as "kind" as the ones you met in the airport, there will probably not be any significant yelling (yet). The bus will deliver you directly to the Welcome Center, where you will turn in your records and do a little preliminary in processing. After that, the bus will take you straight to your "dormitory." Don't worry if you accidentally forget and call it a "barracks." Your T.I. will be happy to remind you that the Air Force doesn't have any "barracks." More than happy to remind you, in fact.